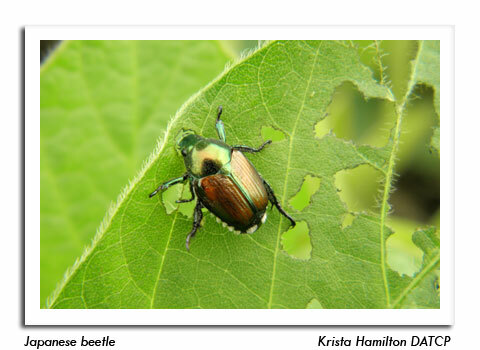 Recently, I have been noticing an increase in adult Japanese beetle activity on garden and other ornamentals. What does this mean for corn and soybean production? It is too early to tell but activity could be picking up in soybeans soon. 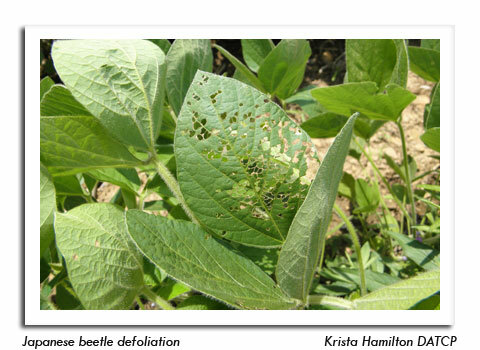 Japanese beetles feed on soybean leaves and present a lace-like appearance. Economic thresholds for vegetative soybean are 30% defoliation and 20% defoliation for soybean in the reproductive stages. That threshold is based on % defoliation for the entire plant, not just the upper leaves. We have observed soybean defoliation for a number of years. However, significant silk clipping in corn has been observed the past few years. When corn starts to pollinate, check fields for adult Japanese beetle activity and signs of silk clipping. Treatment may be required if there are more than 2-3 beetles/plant, silks are being clipped to ½ inch of the ear tip and pollination is less than 50% complete. 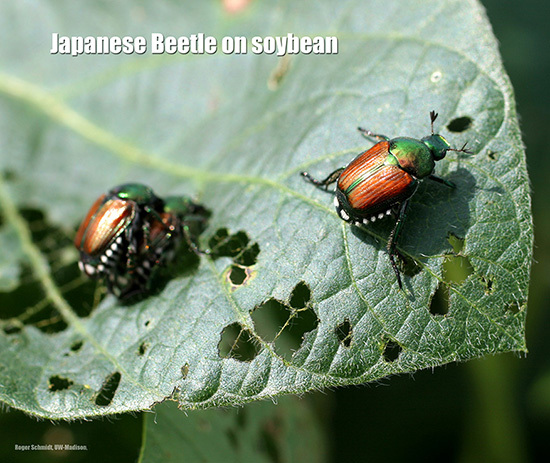 In both crops, adult Japanese beetles tend to be very clumped in their distribution. Be sure to use a field average when scouting so as not to overestimate the potential for damage. Consider spot treating those areas which are over threshold. Expect adults to survive for the rest of the summer. An interesting observation regarding Japanese beetles (and other invasive insect pests) is that populations tend to peak as they become established in new areas. Once established, populations tend to stabilize. Japanese beetle adults: ½ inch in length, metallic green thorax and bronze elytra (wing covers), and 6 white tufts of hair on each side of the abdomen below the elytra.